Are the Big 3 Exercises Needed to Grow? Kieran here filling in for Maik. Todays topic: do you need to Squat, Bench, and Deadlift to get huge. Ancient weight-room bro lore is responsible for many incorrect beliefs and counterproductive practices in the world of bodybuilding. The body of scientific research relevant to the practice of training specifically for muscle growth (hypertrophy) is still in its infancy, and as a result many aspiring physique athletes rely on the techniques utilized by crusty veterans, whose joints may as well be made out of sandpaper these days. The point being, many of the recommendations made to young trainees (such as training muscle groups once per week with a “bro-split”) are not supported by scientific research, and better methods have been developed in recent times. One such undying myth is that people need to practice the “Big Three” lifts, which are the squat, the bench press, and the deadlift. The sport of powerlifting is entirely composed of lifting maximum weight on these movements. Many of the old time bodybuilders, including Arnold, competed in powerlifting early in their careers, which is where the myth of using powerlifting-style training for bodybuilding came from. For those who don’t know, powerlifting training involves heaving maximum weights in sets of 1, 2, or 3 reps on the big barbell lifts. This style of training is the best for building maximum muscle strength, but is not ideal for maximizing muscle size (which is something Arnold eventually recognized). For one, bodybuilding is not weightlifting. You are not rewarded for how much weight you can lift; your physique says it all. 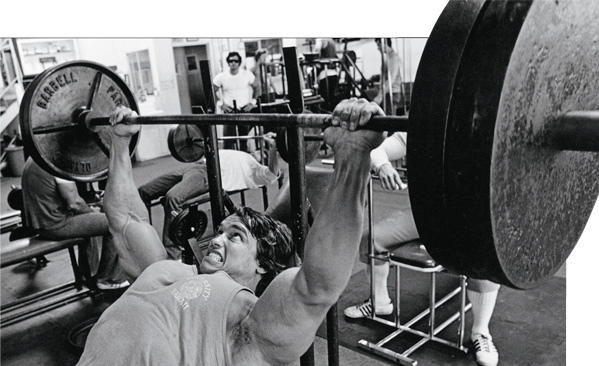 As Arnold himself would say, the weight is just a means to an end. Second, high volumes of training (lots of sets and reps) are required to maximize muscle growth, and super-heavy weights do not allow this. Also, the risk of injury is much higher when lifting max weights. Third, the best bodybuilding exercises allow for a full range of motion in the target muscle, because stretching the muscle under load is the best way to cause muscle damage, which provides the signal for repair and hypertrophy. The wide stance, hips back powerlifting squat, barbell bench press, and deadlift from the floor do not allow for the longest ranges of motion. You would be better served with the Smith Machine squat, the dumbbell bench press, and the stiff leg deadlift for the purpose of building muscle. This is not to say that training for strength is a worthless goal! In fact, I would say that muscles without strength are about as useful as decaf coffee. By all means, feel free to incorporate some heavier work in the context of a well-planned training cycle. Previous post: DO YOU NEED TO TRAIN HEAVY TO GROW? Next post: Take your physique to the next level!